Nylon material is used frequently in a self lubricating bearing surface or slide type applications. Resistant to most common chemicals. One of the most popular work horse materials of the mechanical plastics family. The number designations that follow each type of nylon refers to the number of carbon atoms contained in the material’s prior polymerization process. Used in Food Processing, Automotive, Fluid Handling, Electronics and Mining applications. Other brand or trade names for Type 6/6 and Type 6: Vekton®, Unipa®, Tecast®, Nyoil®, Tecamid®, Sustamid®, Capron®, Nylatron®, Ensilon®, and Zytel®. 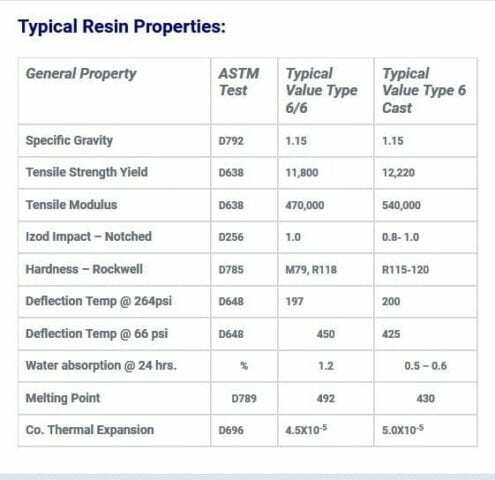 Common Specifications for Nylon 66 include: L-P-410 (LP410) with some exceptions, ASTM-D-4066 and ASTM-D-6779. Contact us for additional information on specifications. This materials is…excellent wearing and very abrasion resistant. Introduced in 1938, and now one of the world’s most recognized plastic materials. Inherently dimensionally stable makes for consistent finished parts. An extremely tough material used in numerous demanding applications (like Carpet fiber and common Rope). This is hard to quantify, as we can produce from small to massive blocks and ‘near net shapes’ in a limitless range of sizes. Simply let us know the size and shape you are looking for, and we will do our best to produce a Cast Nylon Part that size. Cast Nylon is available in Natural (Tan – Beige), Blue, Oil Filled, MD Filled, FDA grade, Black and other specialty formulations. Use your imagination! Discs – 2.0″ x 72″ diameter in Natural (Tan – Beige), Blue, Oil Filled, MD Filled, FDA grade, Black and other specialty formulations. Many shapes are available in thicknesses up to 14″. Please give us a call, we have supplied huge blocks and large chunks. You read that right – tube. 2.0″ – 36″ OD with a huge variety of wall thicknesses. The lengths depend on the wall thickness, but generally up to 48″ long. These Cast Nylon Tubes are available in Natural (Tan – Beige), Blue, Oil Filled, MD Filled, FDA grade, Black and other specialty formulations. The term tubular bar is another name for a round tube of material. As above, there is a huge range of sizes of Nylon in a tubular bar shape. Please contact us with your wish list, and we will be happy to assist. Nylon Massive Blocks, Huge Sheave, Near Net Shapes – Nylon – Polyamide Glass Reinforced in various percentages of glass, Oil Filled, FDA approved Oil Filled, MD Filled, Blue, Type 6, Type 6/12. Custom sizes, formulations and colors. Massive and Near-Net Shapes on special request. Rod and Rods are available up to 120″ long in huge diameters. Sheet sizes up to 48″ X 96″ in most varieties. Give us a try, we can probably do what you need. These Properties are for evaluation purposes only. This information is not to be construed as a warranty, guarantee or assurance that you may achieve the same results. Materials made from different resin types, manufacturing techniques and manufacturers will react differently. The information should be used to compare against other materials only, and each user should make his own tests to determine suitability. No warranty as to this materials suitability are either expressed or implied.